I'm very interested to see where fans of this line want to see there favorite characters come from. Ether it be Dragon Ball, DBZ or GT. Be Characters From non canon films like Broly, outfits and forms that only appeared in games or characters that appeared in manga based in the Dragon Ball universe such as Jaco the Galactic Patrolman. Do not really care where they came from. If the character is cool and i like the design i probably may get one for my collection. I was pretty sure of what would place first it was what people saw as second and third that interested me. It doesn't anymore. I'd purfer canon + Cooler and more Saiyans Movie/OVA characters over GT, specially now because no one can argue that GT is even a little canon. I have so much love for the designs in GT, Dragonball Z STILL has so many characters to pull from, but GT has some greats as well. Outside of maybe Cooler, I don't know that there are any other movie only characters I want to see right now. A Super 17 would be amazing for instance. Or the SSJ 4 characters/fusion. E: They are tied again now, movies/GT. Do you really want a Bojack figure? I'd love to see Paragus to go with Broly. That being said I want every character in saiyan armor. Also Tapion and I've never even seen that movie. My most wanted Figuarts is from the main DBZ anime, Videl! But I think I want the most from the Movies. Cooler (final form), Janemba (final form with sword), Gogeta (though not sure if I want Gogeta AND Vegito), Garlic Jr. (either form actually), and even Turles would be fun. I've never seen Bojack Unbound, but I'd love a Zangya Figuarts too! So I voted for Movies/OVAs. Then again there's a few from Dragonball I'd really like. But what are the odds they'd ever make a Ranfan Figuarts?? I just remembered one of those video games has Super Saiyan 3 Future Trunks. Wouldn't that be epic?? I completely forgot there was a SS3 future trunks that'd be very dope. There does need to be more females in this line, 18 was very well done even though I wanted her later outfit. Fasha from Bardok's movie. From video game only characters there are a ton of ridiculous power ups and fusions from Dragon Ball Heroes. I cannot even fathom how many that would entail if people were into it. I was just starting to list the ones I can think of from Xenoverse and such, then I remembered Heroes.... I just stopped. I, honestly, wouldn't mind an Evolution Goku. But, that is only because I thought his orange and blue costume was the only good thing about the entire movie. 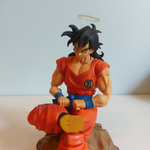 I would swap out the head for normal Goku. I wouldn't want a single other thing from that movie, though. Yeah that gi was very cool. That movie is the greatest movie of all time though, even you gotta admit it. Very true. That's my policy, the only drawback is that there are too many characters I like! Using Dragonball Heroes versions they can re-release characters without just re-releasing them! Broly sold out fast? Well, why not grab a (Legendary) Super Saiyan 3 Broly or (Legendary) Super Saiyan 4 Broly? His hair already went blue though! Hmm, idk. Having an Emmy Rossum figuart would be pretty cool.